You can make a beautiful Rainbow display to decorate your show case to give a “Visual Treat “to the visitors. It emits all the colours of the Rainbow (VIBGYOR) one by one and finally flashes rapidly. 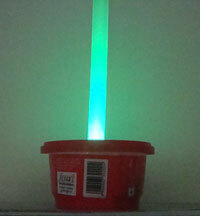 This is a kind of simple “Mood Lamp” to elevate the mind of viewers. You can fix it in an empty Jam pot so that it appears like a “Rainbow pillar”. A Multi colour Flashing LED and Glue stick can do this Magic. Multicolour LED has three chips to generate Red, Blue and Green (RBG LED) lights. Due to the fast transition of colours from one to another, the colour mixes and gives the Rainbow display. The Glue stick commonly used with the Glue gun transmits this light to its entire length giving a good visual effect. So try it, you need only Rs.25 for this. Just a Fun. Make this Beeper using a Multicolour LED. The flashing Multicolour LED gives different colours which changes slowly as well as fast. This circuit gives beautiful colour pattern along with beeps in varying tones. Try and show it to your friends. Here is an automatic Ornamental LED lamp for decoration purpose. It automatically switches on in the evening and turns off in the morning. 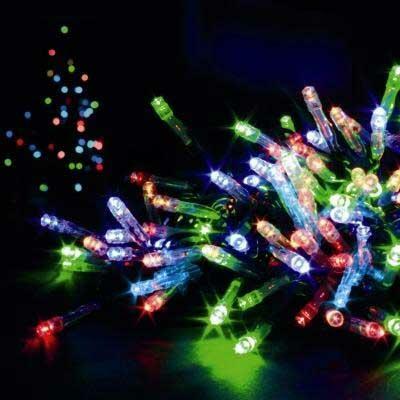 Each string of LED flashes at different rates giving a colorful appearance.